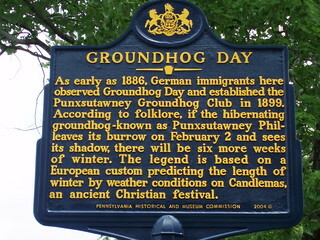 ■ Happy Groundhog Day, everyone! As Bill Murray put it: "A thousand people freezing their butts off waiting to worship a rat. What a hype." We are getting snow at Pun Salad World Headquarters, so the rat would not see his shadow here this morning. … generally ignored by politicians, pundits, commenters. Some Americans may be surprised to learn that agriculture in their country is in large part based on a five-year plan. Most commonly referred to as the farm bill, it is up for renewal this year and—just like in years past—is likely to produce a legislative morass in which the primary beneficiaries are lobbyists and the business interests they serve. Grabow urges pols to (1) take a machete to "the thicket of subsidies and price supports"; (2) break up the gargantuan legislation into smaller bits; (3) spend their resources trying to open up foreign markets for US agricultural products. All good ideas, none of which will happen. The “why” of free markets is the same as the “how”—in short: brainpower. People have problems. For a couple of hundred thousand years, the main ones were finding things to eat and finding ways to keep from being eaten. Yes, Comcast and Apple, Whole Foods and Walmart, Coca-Cola and those $36.99 bottles of “raw water” that Silicon Valley types with too much money are shelling out for all are the products of the same consumer-driven capitalism — but, love it or hate it, most of our ancestors would have considered themselves rich beyond imagining if they came into ownership of the contents of a 7-Eleven. Life before capitalism was solitary, poor, nasty, brutish, short, and lacking in avocado toast. Confession: never had avocado toast. Somewhat unsurprisingly, this place has it on their menu (for $12), and … dammit, now I'm hungry. Did I tell you I met Feynman once? I met Feynman once. ■ The LFOD alert rang for an article in the Los Angeles Sentinel by one "Dr. Maulana Karenga". Still on the Battlefield with Boukman: Remembrance, Religion, Resistance and Revolution. As we come to the end of January and move swiftly into February, the month when we focus most intensely on our history as a world community of African people, let us bridge the months by linking discussions of the Haitian Revolution and how we might better grasp and live the legacy of righteous and relentless struggle it offers us and the world. For January is the month of the celebration of Haitian Independence, the Haitian Revolution and the awesome and world-impactful liberation struggle the Haitian people waged to achieve this. At the center of the sacred narrative of the Haitian Revolution and liberation struggle is the decisive meeting at Bwa Kayiman presided over by the Hougan (High Priest of Vodou) Dutty Boukman and the Mambo (High Priestess of Vodou) Cécile Fatiman. On August 14, 1791, they called the people together at this historic site to conduct a sacred ceremony to free the people’s minds; strengthen their will to struggle for freedom; reaffirm their rightful belief in a Beneficent God of liberation who would guide and assist them; and to commit all to wage the struggle for liberation until it was won—regardless of cost, casualties and the sacrifices required. They took an oath to live free or die – viv lib o mouri! That's the motto in Haitian Creole, Granite Staters. Inspiring, but the denouement in Haiti was pretty grim. It is unclear how much of this "Dr. Maulana Karenga" considers to be "awesome" and "sacred".